Butterscotch is a type of confectionery whose primary ingredients are brown sugar and butter. Other ingredients such as corn syrup, cream, vanilla, and salt are typically part of the recipe also. The ingredients for butterscotch are similar to toffee; the major difference is that the sugar is boiled to the soft crack stage for butterscotch and the hard crack stage for toffee. Butterscotch sauce is often made into a syrup, which is used as a topping for ice cream (particularly sundaes). 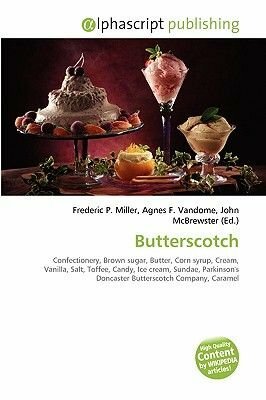 The term butterscotch is also often used, such as in the names of recipes, for the flavours brown sugar and butter together where the actual confection butterscotch is not involved, e.g. butterscotch pudding.